Remember the days when anything Israeli was considered second rate? Restaurants were inferior, homes were inferior, clothing was inferior, heck – even toilet paper was inferior. The fast-growing trend for Jews living abroad to hold their family events here in Israel, is one sign of many that that “inferiority” is simply no longer the case. People choose to marry in Israel for many reasons, and not just for the special holiness only found here. There was a time when families and young couples chose to get married in Israel knowing that their event would be less elegant, a less “regal affair”, and were told to simply count their blessings and enjoy the holy atmosphere. What we used to have to “sacrifice” in terms of style and class by having an event in Israel is simply not true anymore. There is an unbelievably high caliber of hotels, designers, chefs, gown designers, even makeup artists available today that were not available as recently as ten years ago. And the level is ever rising, even surpassing those abroad. Events in Israel are coming into their own, with their unique style and endless possibilities. Israel has become a veritable culinary ‘light unto the nations’. Israelis have known this for a long time, and now the world has finally realized it too, thanks to the many internationally bestselling Israeli cookbooks and award-winning Israeli restaurants. Israeli wedding dress designers are taking over Bridal Fashion shows worldwide with their stunning collections. It would be difficult to go to any event anywhere in the world and not hear the most popular Israeli songs and music stars. Bridal makeup artists in Israel are trained in the US and Europe at the most acclaimed beauty institutions, always updated on the most current industry trends and items to offer their clients in Israel what they are used to “from back home”. Can we talk gorgeous venues? Considering the small size of our country, it’s astounding the variety of types of hotels with international award-winning acclaim in all types of categories from urban luxury to desert glamping to legendary landmarks to forest spa. The landscapes, seascapes, and sunsets just add to the glamorous options available. I pride myself on picking and working with the very best that Israel has to offer, and being in the know when it comes to unique vendors to ensure that my clients have the event of their dreams. The ever-growing number of sophisticated and high-end events here, including bar/bat mitzvahs and weddings, show that this tiny country can give any affair across the globe a run for its money. Your level of expectations as an American, European or anywhere worldwide can now be met, in all aspects including sophistication, trendiness, glamour (! ), service and costs. Some of the requests I fulfilled for my clients’ events in Israel include providing the highest quality Russian caviar, custom colored tulips from Denmark, private jet planes, authentic Irish bagpipe players, Moroccan belly dancers, state of the art American makeup applicators, award-winning Israeli singers, and much more. The days of having to choose between having an event in Israel, or having a glamorous event are in the past. However, I can’t promise your Israeli cousins won’t show up in jeans and flip flops to your elegant beachside wedding. “Event Planner” may be a somewhat misleading title. Of course I’m the one hustling behind the scenes making sure what you see is your beautiful, shiny, magical celebration, and that you remain blissfully unaware that the florist was late, that I had to stitch up a seam on a bridesmaid’s dress, or that the tables were not set up according to the original plan. I am there to take care of it all so it’s not even on your radar and you can enjoy your day. I can see how you would think that that’s the biggest part of what I do. However, if I were to add a secondary job title I think it would be “culture melder.” People come to me from all over the world to join together in Israel to celebrate their marriage and I am the one who bridges the cultural gaps between two spouses-to-be, two families, and even between children and their parents. Mix and match as you like, I have seen it all: South American and Dutch, Israeli and American, Cuban and Moroccan, Russian and Japanese, Australian and Canadian, just for starters. As we know, in this day and age the culture from your country of origin is hardly the only determining factor. Very often the level and style of Jewish observance of the bride and groom reflect very little on how they each grew up. I have planned Modern Orthodox weddings, Chassidish, weddings when one (or both) are converts, baal teshuvas, and combinations of them all, so you can imagine that this is where things can get complicated when it comes to communicating between two families. Often I work with a couple who lives here in Israel and their parents live abroad. It is important for me, as well as for the bride and groom, that their parents feel like the hosts of their children’s wedding. What does that mean exactly? I make sure to explain the importance of respecting everyone’s culture and I make sure everyone is comfortable – including their guests. But as an event planner, or culture melder, this means knowing the right questions to ask. The bride and groom may consider themselves “Israeli” despite growing up somewhere else, they frequently identify with a lot of Israeli customs and culture that are quite literally foreign to their parents. They may take certain customs for granted, having attended literally hundreds of weddings in Israel, not even realizing that their parents are coming with a wholly different set of expectations. This is where balance comes in. It is important for the wedding to reflect the couple, and it is equally important for the wedding to reflect their parents and families so it can truly be a representation of where they came from, and where they want to go in the future. At weddings there are various emotional triggers like music, food and traditions which can all elicit a visceral reaction- often quite unexpectedly! Music can remind the father of the bride of childhood celebrations. A certain dessert can evoke a tear or two if it reminds the mother of the groom of her mother that has passed. These small nods to your family of origin is what makes them feel they are an important part of the celebration. The absence of a family tradition can cause unnecessary sadness and stress. I ensure that no one’s needs overshadow anyone else’s and creating events where everyone feels heard. A trusted person outside the family can often make all the difference in the world in keeping the harmony. I’ve encountered families with differences in religious backgrounds between the parents and the couple-to-be, when the couple’s current observance and connection with Jewish tradition is much stronger than what they learned at home. I make sure that the parents of the bride and groom feel completely in the loop and are included in every step so that by the time the wedding comes around everyone is as emotionally and psychologically prepared as they can be. It’s common (and lovely!) to provide programs for wedding guests, yet, it is vital that I get that information to the couple’s parents well in advance, answering questions and addressing concerns. Getting the combination just right of balancing varying cultures and meshing the traditions requires a delicate hand. Several months ago I planned a wedding using the groom’s customs at the chuppah ceremony, while the bride’s country of origin showed up in full force through the music and color scheme. Since the couple were both living in Israel for a few years prior, there was plenty of Israeli music and food to make sure this event reflected all of the facets of the couple. Another couple who I can easily say did not fit into any “box” wanted to create something that was accepted by Jewish law, while at the same time felt true to their own values and completely something of their own. I introduced them to a Rabbi who was more than happy to help and he arranged for them to both sign the ketuba, allowed the bride to break a plate when the groom broke the glass, and both recited something meaningful to each other under the chuppah. It was a truly personalized ceremony that made the couple feel empowered. The news has broken this week that the Israeli company “EasyWed” has gone out of business. Declaring bankruptcy, they have shut down their website, closed their offices, erased their Facebook page…. And kept deposit checks. The CEO’s phone has been shut off. While the economic press in Israel is all aflutter, the brides are, well, understandably bereft. For some, it may mean having to cancel all of their wedding plans, as their bookings were all through the site. For some, it will mean starting their new life with financial uncertainty due to the loss this causes them. It’s tragic for customers whenever any business closes. But there is something particularly depressing about lovebirds losing the wedding of their dreams, and finding out on Chanukah. 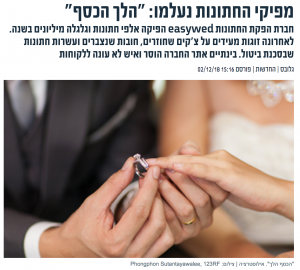 EasyWed provided “group rate discounts” and promised brides and grooms a savings of hundreds of shekels by using their site, rather than hiring service providers directly, or using a traditional wedding planner. While we of course sympathize with the couples who lost a ton of money while planning their dream weddings, we need to think about the huge loss to the vendors as well. While the Hebrew press completely ignored this part of the story, I have spoken to many of the photographers, bands, and other service providers who were in contract with EasyWed, some of whom lost tens of thousands of shekels because the company declared bankruptcy. As an event planner for many brides each year, I understand the emotional and financial investment that goes into each ceremony, each party, each family decision. While my heart breaks for these families, it’s an opportunity to advise anyone planning a wedding in Israel. Everyone loves a great bargain, to score a coupon or discover a deal. Particularly in Israel, natives and visitors alike love the rush of the negotiations, the thrill of the deal and the feeling that no matter where you are, you are in the open market. I suggest that there are certain industries and certain services or products where there are no shortcuts and no coupon codes. Unfortunately, the wedding industry isn’t the shuk. Simply put, you get what you pay for. Your wedding is a day you will remember for the rest of your life and when you choose a venue, a dress, a caterer and menu, decide about tables, flowers, photographer, video and more, the most important choice that will affect ALL your choices, is to work with someone you can trust. Event planners are as different as weddings are, and it is a worthwhile investment of your time to find the right one, who will help you express your individual personalities, realize the vision for your event, and who can respect and work within your budget. Invest in yourself and your special day, it will be money well spent. TOP 5 PICKS ON WHERE TO CELEBRATE YOUR WEDDING IN ISRAEL! Tower of David- The grounds of the Tower of David Museum will have you and you guests feeling like you are transformed to ancient Jerusalem. Events take place in the courtyard with amazing views of the Old City. Bustan at Abu Gosh – Where your special event is set in paradise. Just outside the village of Abu Gosh in the Judean Hills (about 15 min outside Jerusalem). Bustan Abu Gosh is managed by professional catering company Liav and surrounded by trees and greenery. The space can fit between 300-600 guests and open from May-October. 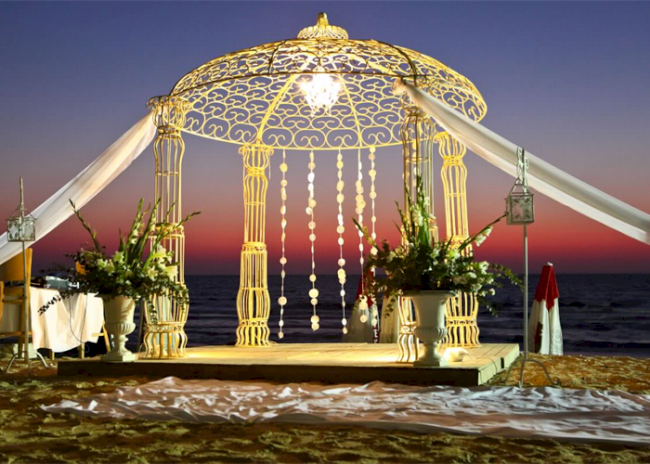 Gazebo (Herzliya)- Located on a small cliff overlooking the sea in Herzliya, Gazebo (which is also a surf club) is a hideaway spot which hosts intimate weddings for up to 100-400 people and specializes in breathtaking sunset weddings. Cochav HaYam in Caesarea sits atop the beaches of Caesarea with a large indoor space as well as lawns that fit up to 1,000 guests.